Here is the MacBook setup. Rick said I should take a photo with some of my project photos on the screen. I didn’t want to transfer any photos over before I take a one-to one class and ask the best way to organize them. 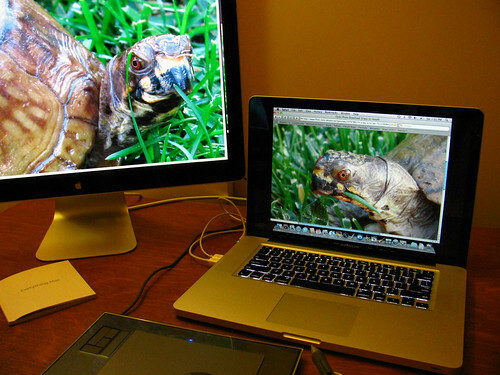 So I just opened flickr and used photos of my darling tortoise, since darker photos on the display screens seemed to photograph better. I also had to take the display brightness way down, plus put the camera in manual and adjust some settings. There is so much to photography that I still don’t know. You can see the stylus and pad in the bottom of the photo. Rick likes using a pen and I like a mouse and both work on the pad. Here is a tip on buying a pad. Smaller is better because you do not have to move your hand around so much. You can zoom into an area for details, so the bigger pad is really not necessary. Rick had a big one on his first laptop, so found this out by actually working on them. He uses one at Disney that he draws right on the screen in that case bigger is OK since it like drawing on paper. I still have lots of old PC stuff to go through. In the early nineties I actually assembled a 486 computer from parts. Giving up all that knowledge is a bit unsettling, though most of it is so out of date as to be useless. Hopefully I can get through it all by the new year for a fresh start on a more up to date way of working. One that will leave me more time to craft. This entry was posted on Sunday, December 28th, 2008 at 3:00 am and is filed under Life, Photography and Tools. Tagged: Life, Photo, Photography, Supplies. You can feed this entry. You can leave a response, or trackback from your own site.